According to a royal source, the The Queen is distressed by the row over Islamic law which she fears threatens to undermine the authority of the Archbishop of Canterbury and damage the Church of England. According to a royal source, the Queen has not expressed any view on whether Dr Rowan Williams was unwise to say it was “unavoidable” that aspects of the sharia legal system could be incorporated into English law. But as Supreme Governor of the Church of England she has been dismayed by the controversy that the remarks have generated at such a difficult period in the history of the Established Church, which faces possible schism over the issue of homosexual clergy. The Queen, who approved the appointment of Dr Williams on the recommendation of the Prime Minister, takes her role as Supreme Governor very seriously. One royal source said: “I have no idea what her view is on what the Archbishop said about sharia law. But the Queen is worried, coming at such a difficult time in the Church’s history, that the fallout may sap the authority of the Church. The dismay felt by the Queen is mirrored by readers of The Daily Telegraph, who have written in great numbers to voice their concern at the consequences of the Archbishop’s remarks. The Prince of Wales has stayed out of the controversy but as a future King he is known to be concerned at the decline in attendance at the Church of England and at the number of churches that are being closed down. Church congregations in rural England have fallen by more than a third since 1989. Speaking on Monday to the General Synod, Dr Williams refused to apologise for his remarks. He failed to quell all the dissent which arose after he claimed that Britain had to “face up to the fact” that some citizens did not relate to this country’s legal system and argued that officially sanctioning sharia law would improve community relations. The intervention triggered a political and religious backlash. Senior Church figures, Muslim MPs and even the equality watchdog condemned his remarks. 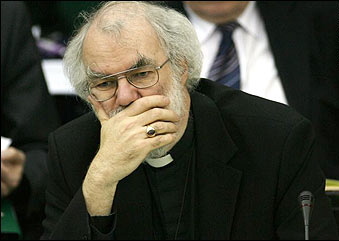 The criticisms were led by Lord Carey, his predecessor, Cardinal Cormac Murphy-O’Connor, the head of the Roman Catholic Church in England and Wales, the Rt Rev Michael Nazir-Ali, the Bishop of Rochester – the Church’s only Asian bishop – and some Muslim Labour MPs. The Archbishop also faced repeated calls for his resignation after claims from within the Church that confidence in him had “plummeted”. Lord Carey said the introduction of elements of sharia would be “disastrous for the nation”. Trevor Phillips, the chairman of the Commission for Equalities and Human Rights, said the Archbishop’s thinking was “muddled”. The Labour MP for Perry Barr in Birmingham, Khalid Mahmood, urged Dr Williams to step down. In response to the initial furore the Archbishop tried to clarify his remarks. A statement on his website claimed he had “made no proposals for sharia in either the lecture or the interview, and certainly did not call for its introduction as some kind of parallel jurisdiction to the civil law”. In his address to the General Synod he also insisted it had been “appropriate” for him to speak on the issue, but admitted he had been “clumsy” in the way he had discussed it. Sharia is the body of Islamic law implemented in some Muslim countries, including Saudi Arabia, Libya and Sudan. In some, it is associated with draconian punishments for crimes such as adultery or blasphemy. The concern over the standing of the Archbishop was underlined by the intervention of Downing Street this week. Gordon Brown telephoned Dr Williams to give his support. The Prime Minister’s spokesman later described him as “a man of great integrity”. The Queen gets on well with Dr Williams. Last year the Queen and the Duke of Edinburgh were entertained to dinner by the Archbishop and his wife at Lambeth Palace. When she opened the General Synod in 2005 the Queen made an apparent reference to the splits and divisions in the Church over issues such as homosexuality and women bishops. Welcoming the appointment of Dr John Sentamu as Archbishop of York, she told him that he and Dr Williams faced a “heavy burden” of responsibility over the next few years. Church of England plans to transfer the ownership of thousands of rectories and vicarages to dioceses have been rejected by the General Synod. Bishops joined clergy and laity to attack the proposals, which critics said represented a £4 billion property grab from parishes.